In one week, the most magical of shopping days will be here… Black Friday! Get excited people, I know I am! I’ve been going through Black Friday ads for the last week and this weekend I’ll start to make my list and plan of attack. Know what else is going to be part of my Christmas shopping plan this year? Shopping the little guys too. In the last year I’ve had quite a few small businesses and Etsy shops offer giveaways here at Three Times the Giggles. Those businesses’ generosity has been awesome, and I wanted to try “pay them back” a bit, by encouraging you to check out their shops when you’re shopping for gifts this year. Below is a list of links, shop names and descriptions. All of these folks donated prizes (some twice!) in 2010 and I would love to see them get some more business. Honeysuckle Designs Jewelry – lots of gorgeous earrings, bracelets and necklaces. Indestructibles – books that babies and toddlers can’t destroy – really! Charmed by Kara – fantastic, hand-stamped necklaces and bracelets. She can fit up to 6 names on one of her necklaces! If you end up ordering from any of these folks, thank them for hosting giveaways this year on Three Times the Giggles! A post about small businesses, wouldn’t be complete if I didn’t mention my own little Etsy shop, Giggling Sweets. This week I announced the deadlines and limits for Christmas orders this year and I added a brand new item to my shop! 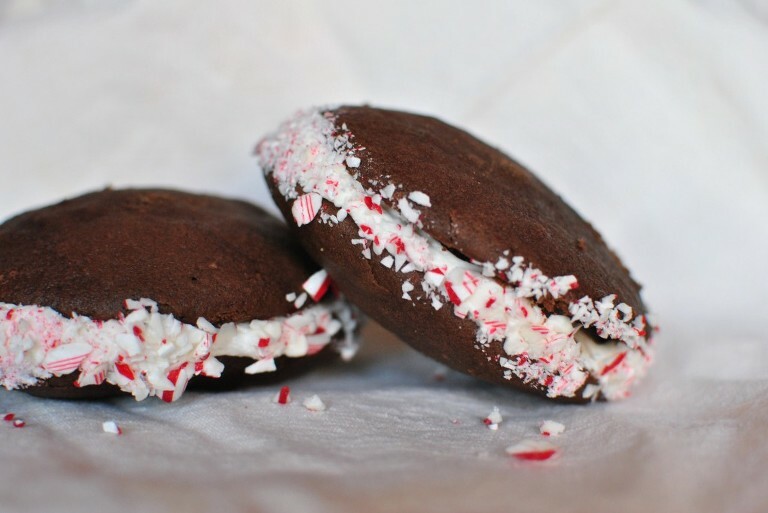 I present to you, the Candy Cane Whoopie Pie!